Y’all know that Halloween is one of my favorite parties to host throughout the year, and of course it’s the best excuse to transform my place into a haunted house! This post is sponsored by Cortland, but all opinions are my own. I have been hosting theme parties in my home for 8 years now (what?!) and out of all the parties that I host, Halloween is the one that I spend the most time on decor! Years ago, I “inherited” a ton of scary Halloween decor (really scary!). There was a guy in my friend group who used to throw some outrageous Halloween parties before my time in Dallas; after he got married, he officially passed the torch to me by giving me all of his party decor. It was a big day. haha! 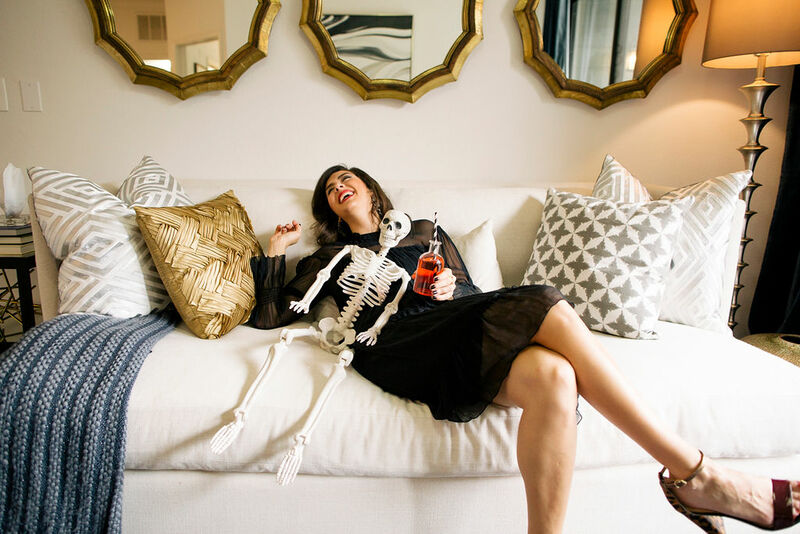 Over the years, I’ve edited the tacky decor collection and added some of my own touches to make the party vibe a little less creepy and a little more…me! So every year, I love dragging out my boxes of decor and deciding what to use, BUT one thing I hate: there is barely any light in my main party space so I can never get a great photo of my setup! I spend so much time getting ready and I hate that I’m not able to showcase it! #firstworldproblems! 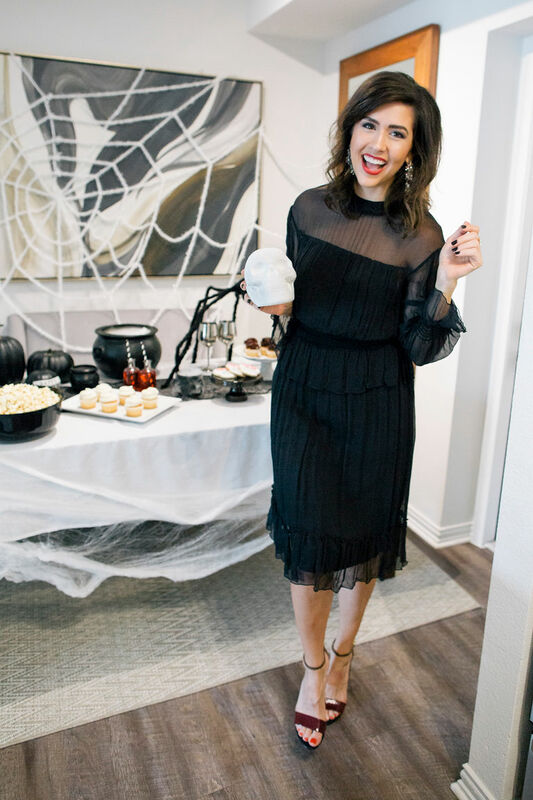 SO this year, I’m excited to partner with Cortland to show you part of my Halloween setup at one of their Dallas communities, the Aleo in Irving! I love that they are all about community at their properties and their design team crushed it in their model apartment, y’all! Huge thank you to Cortland for sponsoring this post and letting me shoot in their beautiful model at the Aleo! If you’re looking for a new apartment, you HAVE to check out the Cortland properties in Dallas- seriously didn’t know that apartments could be this cute!! (mine never were! haha) When apartment hunting and decorating, keep in mind spaces that you can easily transform for events and entertaining, if that’s as important to you as it is to me! 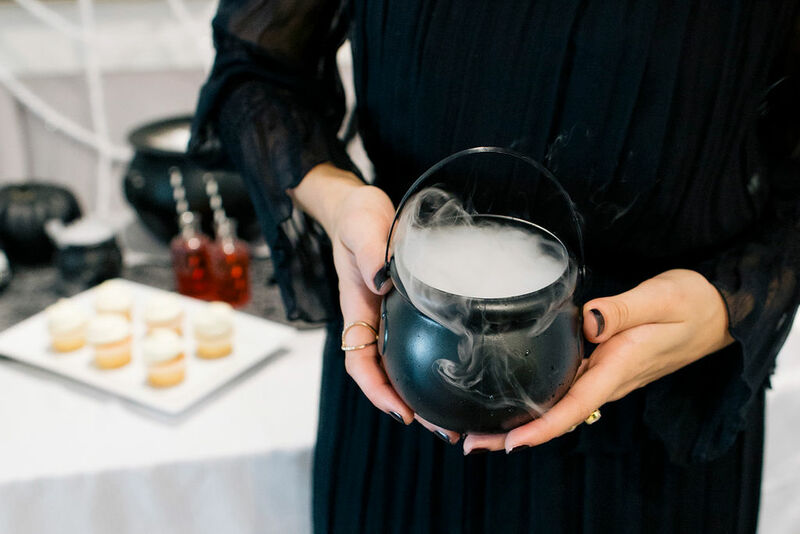 Here are a few of my top tips on hosting a Halloween party (or any event in general!) and where to splurge vs. where to save when prepping for your party! First, determine what kind of party you want to have. Is this a dinner party? Classy creepy cocktail party, costumed dance party…what are the party vibes you want to achieve? You have to decide what your party goals are before you can begin to think about decor. I personally LOVE a good costume party - they are the best way to meet new people! I’m sure you’re great, but I promise you’re much more memorable and easier to point out dressed as Mary Poppins than “the girl with brown hair over there.” It’s also way easier to follow up with new friends after a costume party…tag those photos, make those friends, and don’t be shy! After you decide what vibes you’re going for, you can think about the guest list! Last year, my next door neighbors came to the party, and I loved having them! That’s one thing that I miss about apartment living- you have so many potential new friends right there in your building! I love that Cortland communities focus on providing great resident experiences so you can connect with your neighbors! Don’t Decorate Every Square Inch. After you have your party vibes nailed down, you can start to think about areas of visual focus in your space. If you have any restrictions in your space, like no holes in walls, you may want to stick to a table installation, which can be just as impactful! You don’t need to cover every wall and every surface with decor. Ain't nobody got time for that! Well thought-out displays are more impactful than random decorations scattered throughout your entire space. A few natural areas of focus that might work for you: dining table, kitchen bar, front porch, bar cart, and your coffee table. I personally love using the dining room table as a large food presentation- it’s a great way to incorporate themed food and drink into your decor. 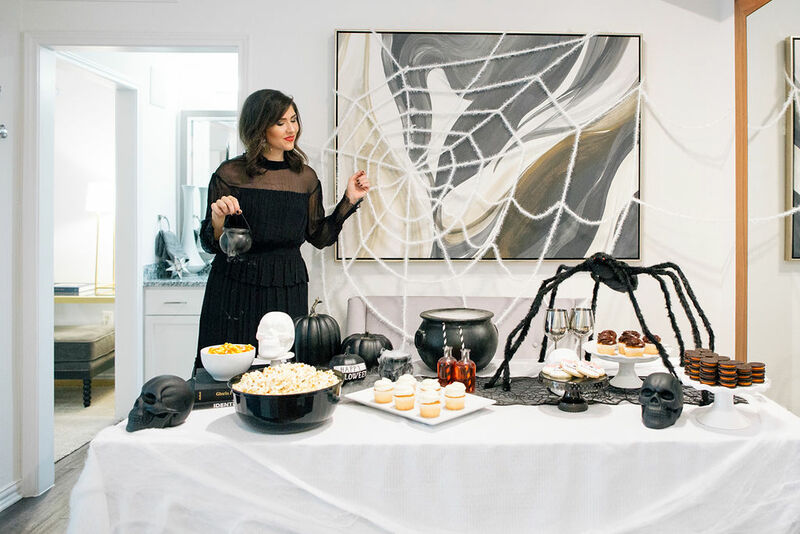 The dining room setup in this Cortland apartment is perfect for a large table display and I was able to add a spooky spider web to the wall without having to move any art or rearrange furniture (always a win!). Now that you know what kind of party you’re having and where your main visual touches will be, let’s talk about decor! When I inherited my friend’s Halloween decorations, I had boxes and boxes of creepyyy Halloween items- I’m talking demon babies and scary ghouls… not exactly my style! Over the years, I’ve gotten rid of some of those pieces and instead of replacing them and spending money on themed decor, I’ve opted for generic entertaining pieces that are black and white and can be repurposed for other events throughout the year. I have a few white serving trays and dishes that I use for most of my table displays and mix a few themed items in with them. I love these white serving pieces from Pottery Barn that I bought years ago! I have the rectangular tray and oval tray that I use for almost every event!. If you don’t already own a large drink dispenser, consider investing in one so that you’ll be able to use it whenever you have a group over to your place for parties, game nights, etc. Even just using it for water makes it easy for your guests to serve themselves at their leisure. It may not be realistic for you to spend spend spend and host an elaborate event! (it’s not for me!) I incorporate less expensive themed decor items with my nicer serving pieces and everything still looks elevated. For Halloween specifically, I lean toward a black and white theme and focus on bats and ghosts rather than bright orange (tacky!) jack-o-lanterns. Cauldrons, large spiders, and posable skeletons are some of my favorite Halloween props. 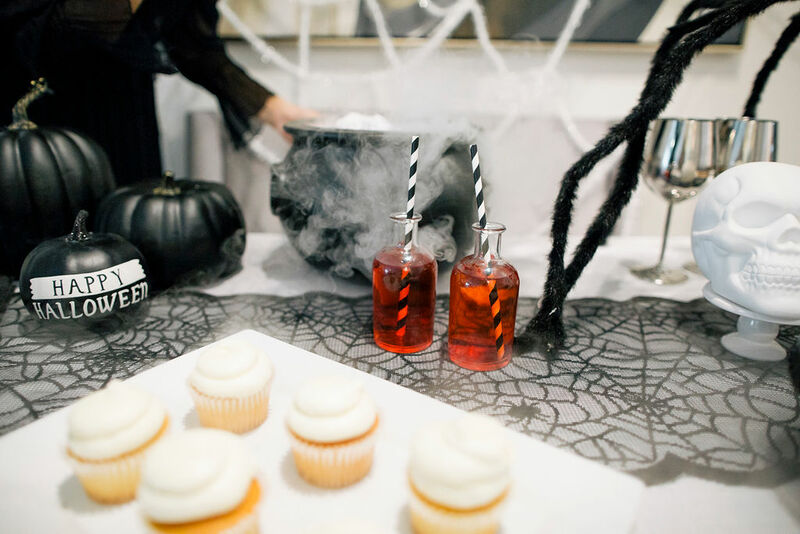 My big decor secret for Halloween is always DRY ICE! Adding some spooky smoke to your setup always makes a huge visual impact. Dry ice isn’t cheap but a little goes a long way, and it’s a better alternative than using a fog machine! I hate the smell of “fog” and definitely don’t want to give guests (or neighbors!) any reason to complain! 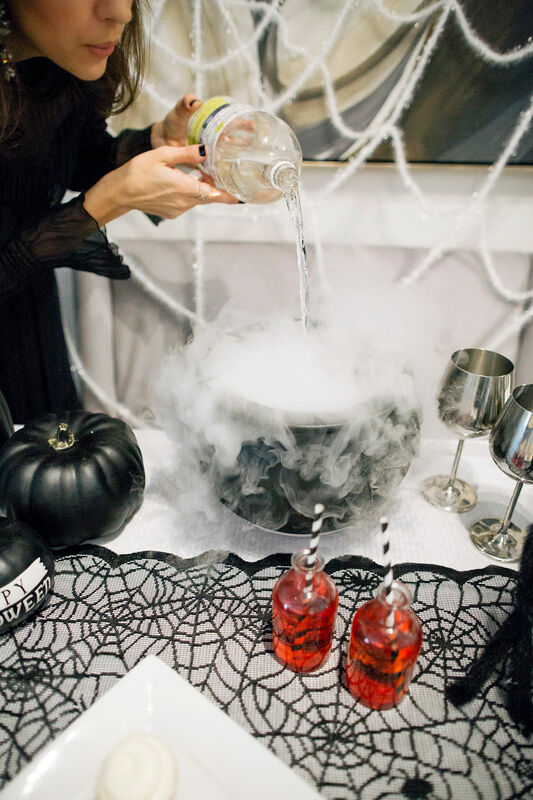 I love serving party punch in a cauldron with dry ice to make it jussst a little creepy. You can also put a bowl of dry ice in your sink and run water on it every 30 minutes or so to keep it smoking and add a special effect to your kitchen or wet bar. 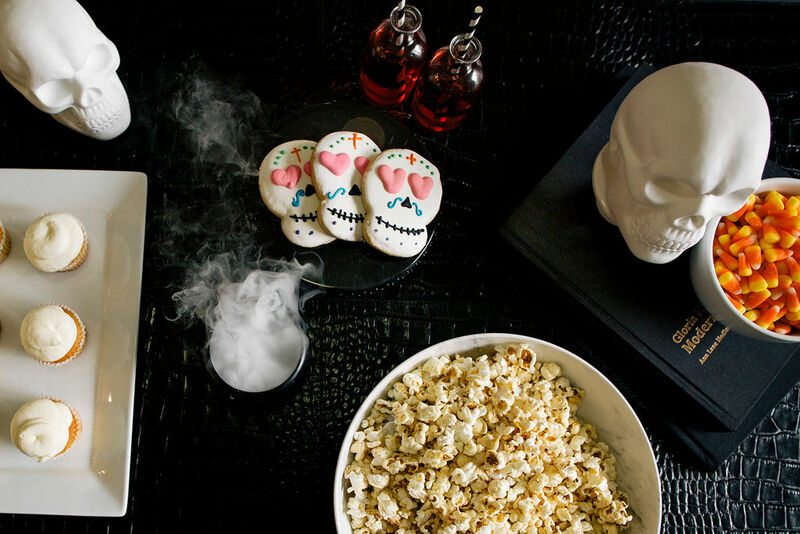 After adding decor to your main party areas, think about a few surprise spots where you can add special spooky touches. I love adding a little surprise in the guest bathroom! Continuing your party theme in an unexpected location adds a little flair that your guests will surely appreciate. 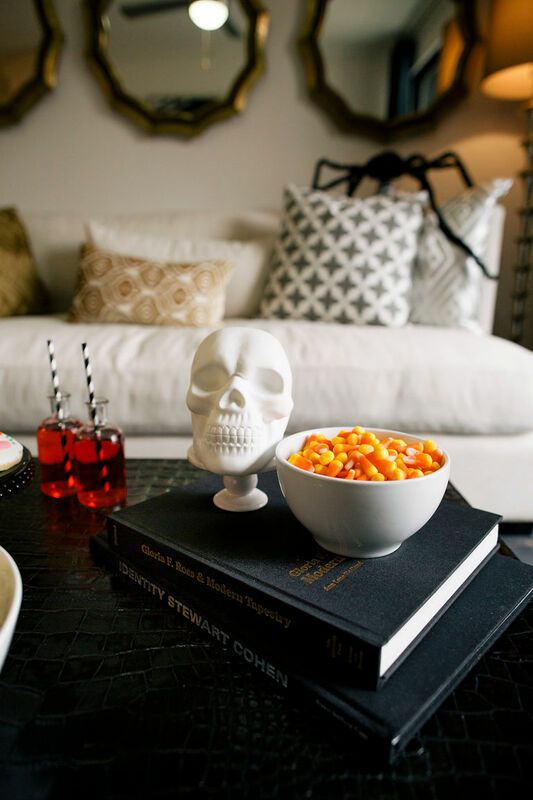 You can also add a few seasonal candy dishes on end tables or near seating that your guests might be using. A bowl of candy corn is always an easy touch, or my personal favorite: Reese’s pumpkins (they always get eaten!). The MOST important part of hosting an event is to have fun! I know, I know. Everyone says that, BUT your guests can tell if you’re stressed or if you’re comfortable in your home and enjoying yourself and they’ll follow suit, so do whatever you need to do to relax before your event and have a good time! Your space is a reflection of you, and even your party decor reflects your style, so make sure you love what you’re creating! After all, your guests appreciate a great party theme, cute decor, and tasty treats, but don’t forget that they’re really coming just to see YOU! The Boo Bash Halloween Party is coming up quick and I can’t wait to see you there! Happy Halloween, friends! Photos by Kaylynn Krieg for The Skinny Arm.